Inkhaus Creative is a boutique website & graphic design studio, located in Myrtle Beach, SC. We're inspired by imagination and innovation, combining creativity with technology to deliver high impact materials through various networks & media outlets. The benefits of smart web design are measurable, and we can account for our clients' successes. Brand identity, custom designed websites, SEO marketing and eNewsletters that build & inform a client's customer base ~ these are just a few of the strategies that have placed Inkhaus Creative as a leading Myrtle Beach web design agency. Ready to move your business forward? We're ready to help you do just that. The Carrell Group was one the first clients for Inkhaus Creative, and has been a perfect example of the successful collaboration between client and designer. The Inkhaus and Carrell Group partnership started with branding, design and print collateral. The project was distinctive and successful, setting the tone for a trusting relationship. The advantage Inkhaus had for Carrell was our skill in both print media and interactive design. This gave us the ability to create a consistent brand across both disciplines from the start of the job. 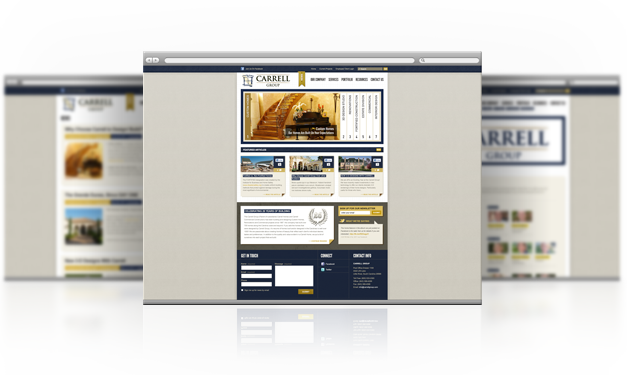 Inkhaus Creative’s full-service capabilities were exactly what the Carrell Group was looking for, and we quickly started the process of website development. We focused heavily on the design and made sure that it would be able to highlight all the services and details for which the Carrell Group were known. Not since the Soul Beat Boutique has arrived. DJs Cooney & Bossaben have been hosting legendary parties for over 10 yrs all over Myrtle Beach & the Carolinas. They keep bodies movin’ with their special blend of Deep House, Latin-Tinged Funk, Rare Grooves & more. As hosts of the epic Full Moon Parties, Cooney & Bossaben have been behind some of the finest events in the Myrtle Beach area & have played alongside world-renowned artists such as Paul Oakenfold, Mark Farina, George Acosta, Saeed Younan and many more. The Soul Beat Boutique are students of both the technical & the aesthetic aspects of DJ’ing. This gives them a unique edge ~ serious heads will appreciate & respect their mixing skills, while others will appreciate their dedication to producing a night where people can let loose and dance to new and vintage sounds in a fun, underground atmosphere. Including choice Pop tunes in the mix is not something many “serious” DJs will do. What place do retro and major Pop hits have in a set of Deep House? Soul Beat Boutique laughs in the face of this misconception. Each event gets bigger, the buzz gets louder & louder, and pretty soon it’s “standing room only” at their parties. Bourbon Street is quickly becoming a Myrtle Beach locals’ hotspot. They feature some of the best local live music around, and have hosted events that bring a unique blend of genres & styles. The Bourbon Street Underground series is just such an event. It wont be long before we see an all-night queue outside this venue ~ we suggest getting yourself to this next event (make haste!). UNIQUE BRANDS + EMAIL MARKETING = SUCCESS! Inkhaus has been thrilled to work with the unique Blenheim Ginger Ale Co. One of America’s oldest independent soda bottling companies, Blenheim has attained something of a cult status. Folks who enjoy their ginger ales tend to be fanatic about it. Some have even created online shrines to the spicy soda. Inkhaus has updated & developed Blenheim’s brand identity. We designed their website to celebrate the company’s rich history, as well as update & connect to fans of the fiery beverage. Recently we launched their online store. 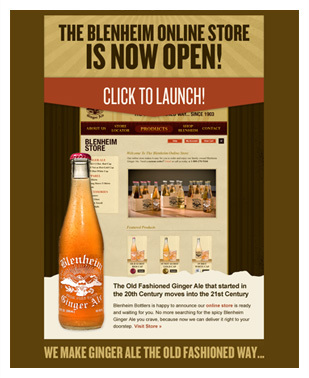 A custom email newletter was created to let fans on the mailing list know that they could now purchase delicious Blenheim’s products anytime. To test the waters a bit, we sent out around 100 email newsletters (roughly 10% of the mailing list). 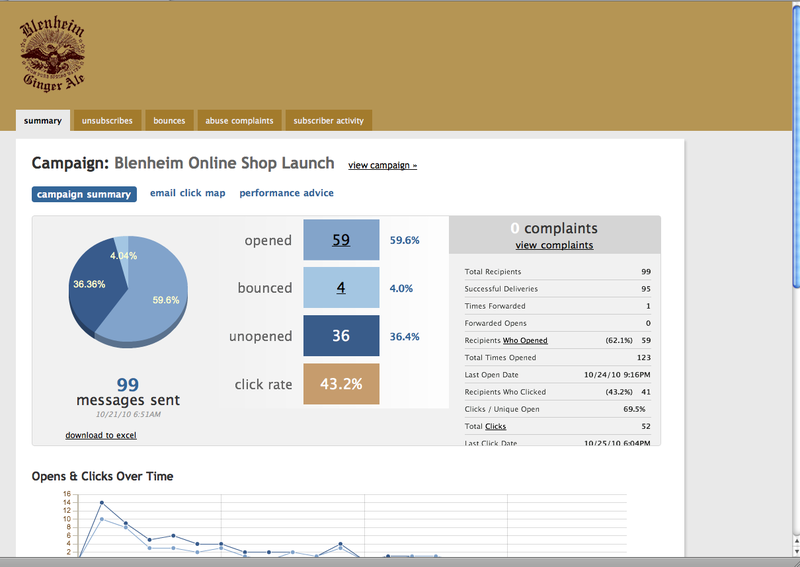 We were thrilled to see that the campaign had almost a 60% open rate. To put this in perspective: the national average is around 23% for the Agriculture and Food Services industry. This resulted in about a dozen orders placed online before noon! This is marketing that works, folks. If you have a niche product or service, consider an Inkhaus-designed custom email newsletter. Reaching out to your customer base in this way is an effective (and measurable) way to boost business. Viva Blenheim! Inkhaus Creative, a Myrtle Beach web design & graphic design studio, was tasked with creating a memorable brand to fit the 2nd Avenue Pier’s highly anticipated remodeling and new construction efforts. As one of the leading branding and marketing companies in Myrtle Beach, our clients trust us to give their campaigns a look & feel that elevates the brand. They allow us to use our fertile imagination to develop a campaign that is cutting-edge and innovative, yet marketable to a wide range of consumers. The Second Avenue Pier is the longest pier in Myrtle Beach, SC and has been in operation since 1938. Hurricane Hugo completely destroyed the pier in 1989. It was rebuilt in 1990, and has been going strong ever since. The Collins family felt that the Myrtle Beach Boardwalk Project would be a strong catalyst for revitalization in the area, so they embarked on a million dollar renovation plan for the Second Avenue Pier. The first phase of the new project will feature a complete overhaul of the tackle shop, restaurant, and top level open air bar. The second phase is a two story retail complex on the west side of Ocean Boulevard. In the future, a third phase on the east side of Ocean Boulevard will be an extension of the pier building, including retail spaces with parking below. Inkhaus Creative was brought in to help create a new look & better brand awareness. The Collins family wanted an updated, abstract look & feel for the new brand. It was also important to retain the character, history & spirit of the 65 year old pier. We created 3 new logos: Second Avenue Pier, Pier House Restaurant and Pier View Bar & Lounge. Each work together to present a cohesive brand identity for the entire project, yet retain an individual identity. All of this ties in to the new website. If your project requires a powerful identity to separate you from the pack, Inkhaus Creative will draw on many years of experience in the areas of business, design, marketing and promotions to create a stunning visual representation of your business concept. Contact Inkhaus Creative of Myrtle Beach, SC for your branding, marketing, web design, print design, social media and SEO solutions. 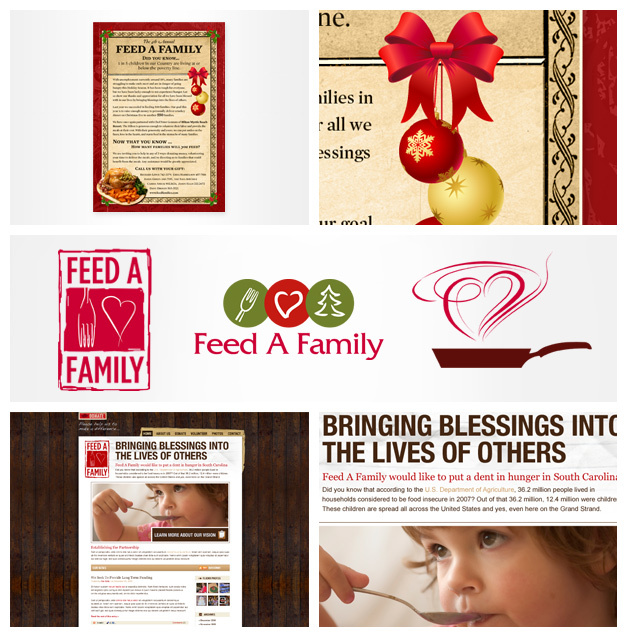 Inkhaus Creative teamed up with Feed A Family to do its part this season helping families in need. We’ve donated our time & design work to create logo & web design concepts. We designed this flyer advertising the 4th Annual Feed A Family program. This charitable organization has helped hundreds of families on the Grand Strand celebrate the holidays. Working with the Myrtle Beach Hilton & its Chef, Peter Gennaro, traditional turkey dinners are being provided to over 500 families. The Inkhaus Team has been fortunate to see their business grow & thrive during a very challenging time. While this is encouraging to us, we are aware of those less fortunate. Doing what we love to help those who are going without is one way we can contribute. We encourage you to do the same, and invite you to be a part of Feed A Family this year! Visit www.feedfamilies.com for more information. We design for our clients, and for their clients. Marketing is effective only when it communicates the client’s message thoroughly. We do our best to build sites that build brands. We integrate SEO, embed flash animation, feature the latest inventory listing software & do it all with design concepts that flow accessibly. So, you know what? It’s nice to get recognized! We’ve just received notice that WeLoveWP has accepted our submission to their site dedicated to showcasing WordPress powered sites. Only about 10% of submissions are considered, and we’re proud to inform you that our client Coastal REO Solutions has their site prominently featured as one of the “Corporate” sites on the ballot. If you’re thinking of re-working your own web presence, or need to start from scratch, take a moment to pursue all of the fantastic sites featured on the site. WordPress is quickly becoming the online solution for many of our clients, and you’ll see why. Having a custom WordPress site will put you in control of your brand. Now, more than ever, small-to-medium sized businesses need to grow their exposure. But most businesses of this size don’t have the budget that bigger corporations do. This makes making large media buys difficult, if not impossible for most business owners. Inkhaus offers solutions through dynamic online campaigns designed especially for your business ~ once we establish your presence on the web, new avenues of communication are open to new prospective clients. You’ll be able to track your growth more efficiently, benefiting your bottom line accordingly. Inkhaus Creative is a boutique agency. What does this mean? Above all, it means that when we take on a client, we dedicate ourselves very exclusively to that client. We feel that effective marketing means understanding your company’s needs thoroughly. We are able to achieve this through this exclusive focus on your business. Working with the Inkhaus team means more than “having a website”. It means having a customized marketing department who works to help you reach and surpass your goals. If you feel that your business is chugging along instead of racing forward, contact us to find out just what a customized marketing department can do for you. We understand that keeping up with the day-to-day reality of any business is a full-time job for anyone. Making the “big push” on marketing & promotion is our day-to-day reality. Let our team become yours. IT’S A FAMILY AFFAIR @ the 405 Lounge ( formerly “Tha Bar”)… 405 8th Ave N // Myrtle Beach, SC… SATURDAY AUGUST 8TH 2009… Aug 8th, we bring you a very special event at the 405 Lounge, formerly “Tha Bar”. Help us welcome back close friend & family, Korry Picco, one of Myrtle Beach’s original house Dj’s. He tore our party to shreds on his last visit and we can’t wait to see what this night has to offer!